My trips last year were to Iowa, Detroit, Rome, northern Wisconsin, and Georgia. Here are the top ten culinary high points. 10. Pulled Pork Sandwich at FRESH AIR BARBECUE (Macon, Georgia). Easily the best barbecue of my swing through Georgia. And the setting was even better. 9. Pizza at BUDDY’S RENDEVOUS (Detroit). 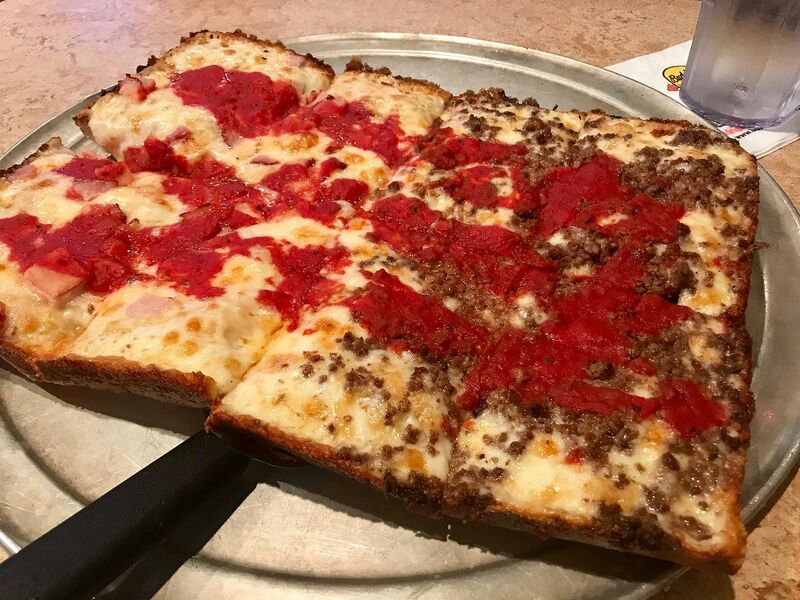 My one previous experience with Detroit-style pizza was the horrible Jet’s chain. So I was very happy to taste the real thing twice this summer, at Loui’s and at Buddy’s Rendevous, the clear winner. 8. Chocolate Malt at BABCOCK HALL DAIRY STORE (Madison). I approached this campus dairy bar with no expecations, but the malt I ordered turned out to be just fantastic, the essence of dairy pureness. 7. Dinner at PAYNE’S (Gas City, Indiana). Actual Brits have run this interstate shack specializing in British pub fare for seventeen years. Another spot I stopped in without particularly high expectations, but left wowed by the attention to detail and standards. First-rate fish and chips (with fries that actually taste like potatoes) and better sticky toffee pudding than I’ve ever had in England. Seven different soups on the menu, a garden maintained out back, and they go so far as to make their own ice cream. 6. Swedish Pancakes at DELTA DINER (Delta, Wisconsin). 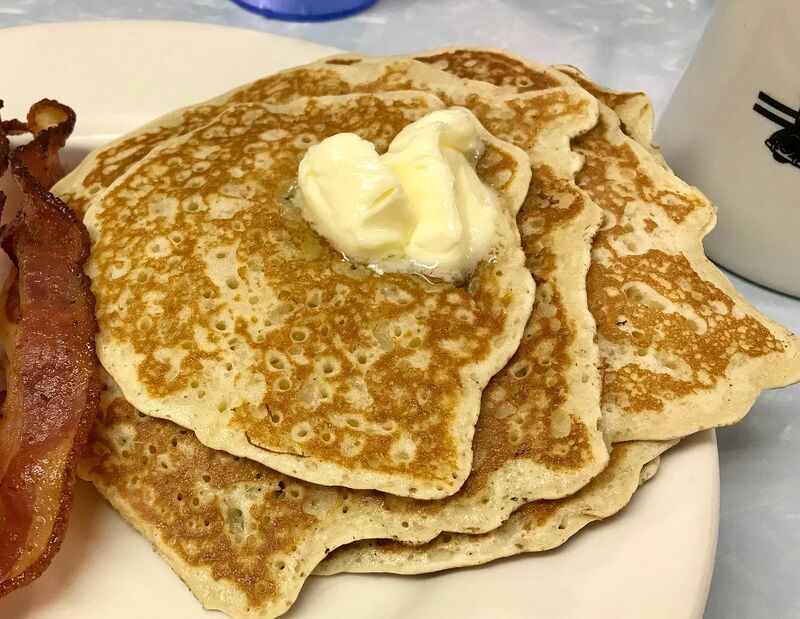 My contention that the best pancakes are found in more northerly climes was borne out by my breakfast at this middle-of-nowhere spot in the Wisconsin north woods. 2018 was the year I finally made it to the Quad Cities for authentic QC pizza, a style I rightly suspected I was already familiar with (minus the long-strip cut) from examples in Indiana’s Calumet Region. 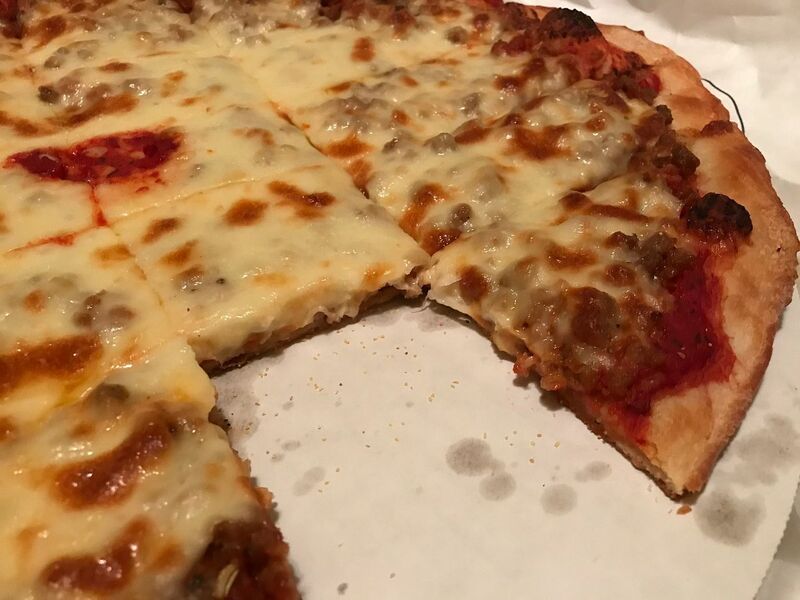 While my pie from Fat Boys (in Davenport) was fine, I have to say I prefered versions from central Illinois (FAT JACK’S) and the Region (LANGEL’S and VILLA PIZZA, pictured). 4. 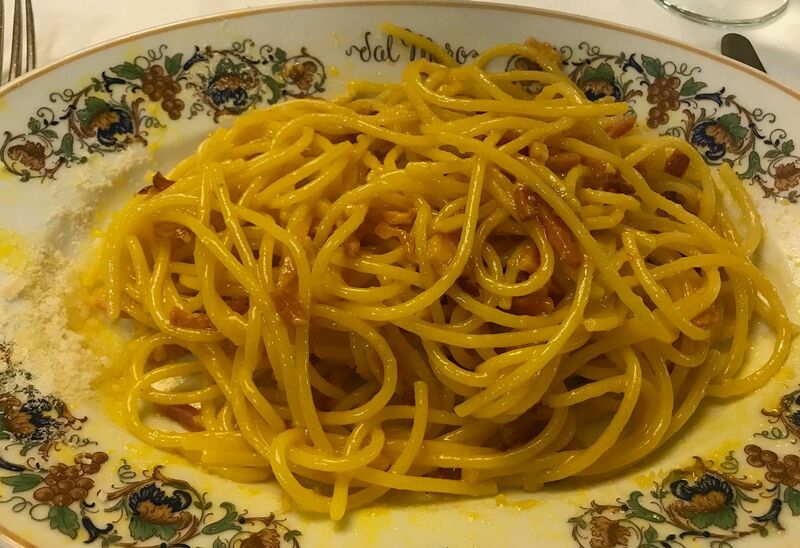 Spaghetti alla Moro at TRATTORIA AL MORO (Rome). 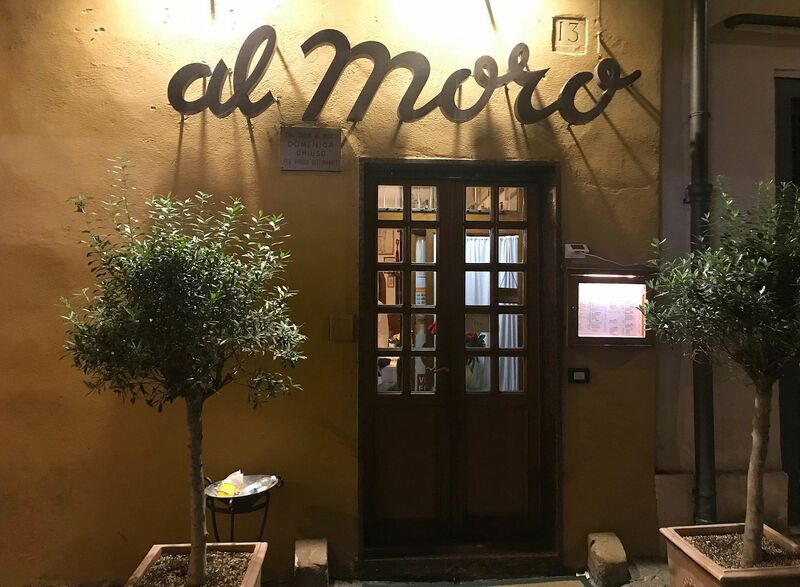 Al Moro’s house carbonara, which subsitutes red pepper for the usual black, was the best version I had in Rome (out of many). 3. 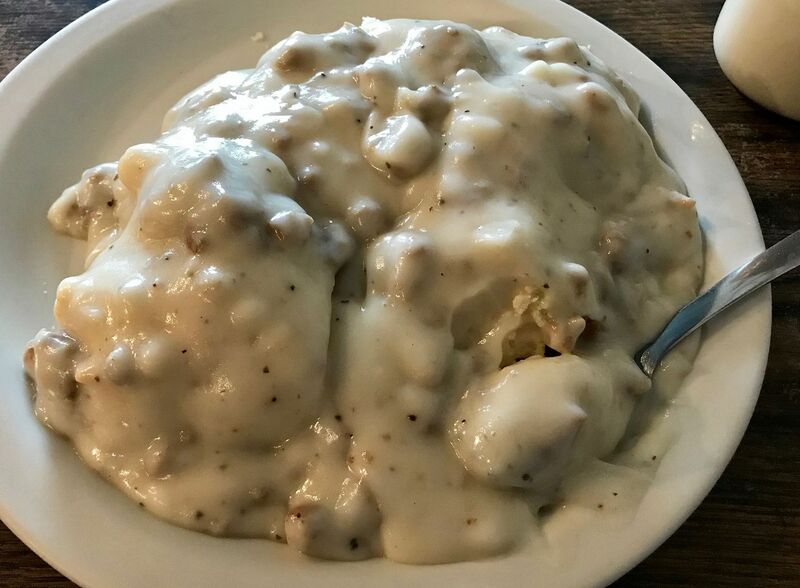 Biscuits and Gravy at COFFEE CUP CAFE (Sully, Iowa). The high point of my tour of Iowa came with my first breakfast stop, at the Coffee Cup in Sully. One of the best (if less than photogenic) plates of biscuits and gravy I’ve ever eaten. 2. Dinner at BEHOLDER (Indianapolis). Jonathan Brooks’s new dinner restaurant is even better than his much-lauded brunch spot Milktooth. Their wild mushrooms in absinthe sauce may be the best thing I’ve ever been served in my hometown. 1. 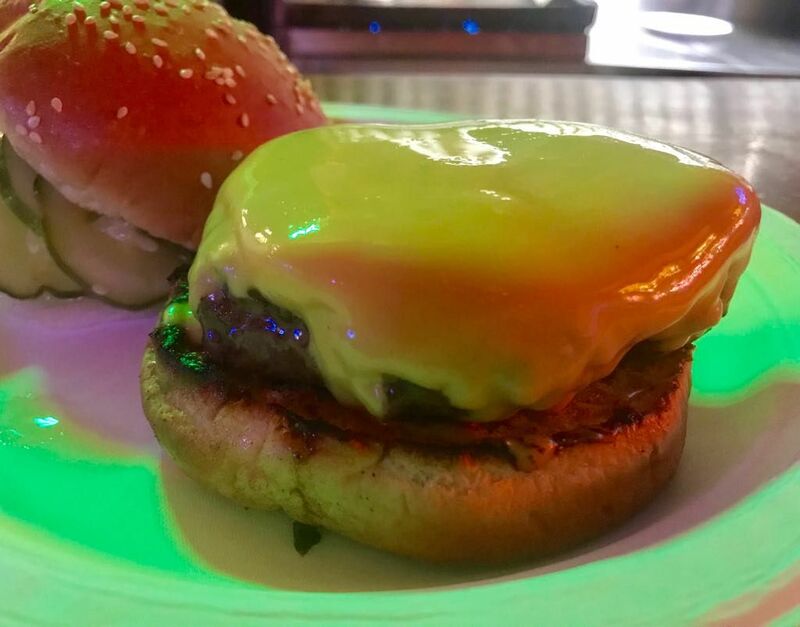 Cheeseburger at NEMO’S BAR (Detroit). I’d almost forgotten what a great burger town Detroit is. I Had the local thin-pattied style several times, most notably from Greene’s and Motz’s. But this bar burger from Nemo’s topped the list: Simply a perfect cheeseburger. Nice line up of an eclectic mix of fine food! Great mix of foods! Most places are new to me...thanks! BTW - pictures not showing up. They are all back and beautiful! Very nice photos. That burger looks fantastic. The Delta Diner looks like a good place to hit, although I don't want to think about being there this week. Wow, those are some tremendous finds! I think I'd need to spend an entire day at Delta Diner, just so I could sample multiple meals there. At the risk of sounding ungrateful for this fine post, where the heck have you been??? Member since 2001, and only 29 posts? Buckaroo, you have something to offer to this forum; don't hide your light under a bushel. Hope to see more of your outstanding work soon! We ate at Fresh Air BBQ some years ago when driving from ATL to Hilton Head to see my father. Thought the pulled pork was great! Glad to hear it still is. I will consider checking out Beholder when I am in Indianapolis in mid-April for a board meeting. There's some big convention in town then, though, so it might be difficult. Even more difficult would be deciding which of my regular stops (Hollyhock Hill, Lotus Garden) I would give up . . .
Nice thread and I hope you have more to add! Babcock Hall ice cream is held in high regard around here; it's some good stuff. Our annual family vacation is spent in northwestern WI and we've eaten at Delta Diner several times over the years, and the food and service have always been excellent. Did you make any other stops, memorable or even otherwise, while you were in the Badger State? Buddy – Sorry, will try to contribute more often. For awhile I was posting more frequently on Chowhound (as Boatman), until their format went off the rails. By the way, we met at Burt’s Place, maybe five years ago. ScreamingChicken – Yes, enjoyed plenty of good eating in Wisconsin, one of my very favorite states. After years of driving by it (and gawking), I finally had dinner at the Hob Nob, near Racine. 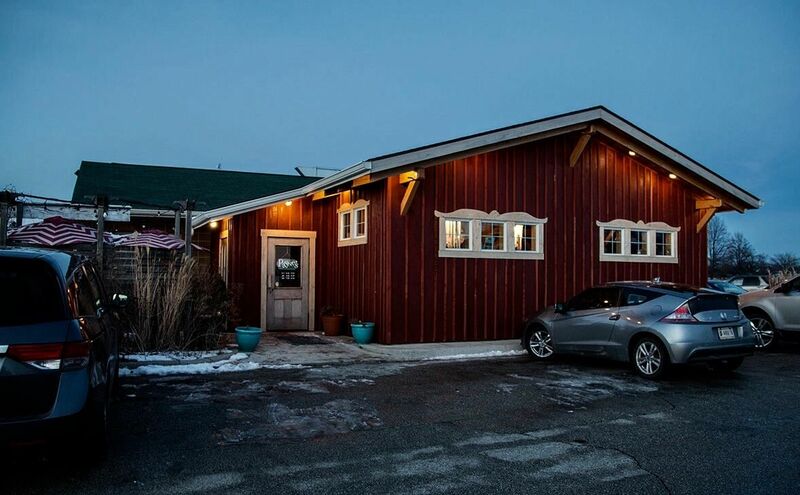 Great steak and, amazingly, inside it’s even better looking than outside. Had a few forgettable burgers and one flawless one, at Al’s (Green Bay); a classic strawberry malted at Mickie’s (Madison); and great fried pan fish in St Germain – lake perch at Whitetail Inn and bluegill at DJ’s (pictured). No need to apologize, just some good-natured chiding from my end. But seriously, you have a lot to offer, so I hope we'll see more of your posts. As for our meeting at Burt's, a lot of faces from all corners of the globe passed through our doors back then, so please forgive me if I don't specifically remember yours. I hope we treated you well and you enjoyed the experience. Suddenly, I am craving spaghetti alla carbonara for lunch today and biscuits & gravy for breakfast tomorrow! Train, thank you for the great pics and delightful report. Ooooh, that fish looks like it's calling my name! Great post - it has put a couple of places on my "to do" list here in Michigan. I also love the Delta Diner - it's about 20 miles from our cabin (which is now sadly 640 miles from my home) and we try to go at least once a year. 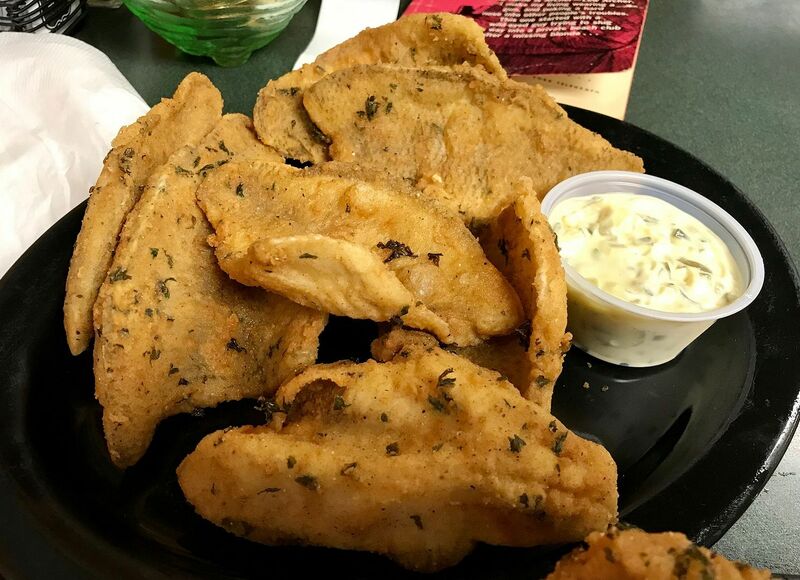 If you or anyone else is in that area, I can also recommend the fish fry or thin-crust pizza at the Barnes Trading Post, about 20 miles from the Delta Diner. Also buried in the forest in the middle of nowhere. We have a lot of nowhere up there. And some great food. My husband loves the Monday night beef tips and noodles special at the Black Bear Inn in Drummond, but ... not me. That fine establishment will be hosting the Bar Stool Races next weekend if you're looking for ... unique... entertainment. I see the Black Bear Inn is for sale...Here ya go Brad...only 239,900. Fresh air BBQ, just outside of Jackson Ga. is legendary in my area of Georgia. I have eaten there all of my life. The building on the left in the picture is the original building for the restaurant. The new one opened sometime in the 60's. While still good in 2019 I believe it was its best in the late 60's and early 70's. How could you resist buying a place that is famous for its bar stool races???? !